at 'Girlfriend's Weekend' events in a gorgeous lodge, located in the wine country near Seattle. as I was typing the word 'vignette', I typed 'Viognette'. If you know wine, you are smiling right now! 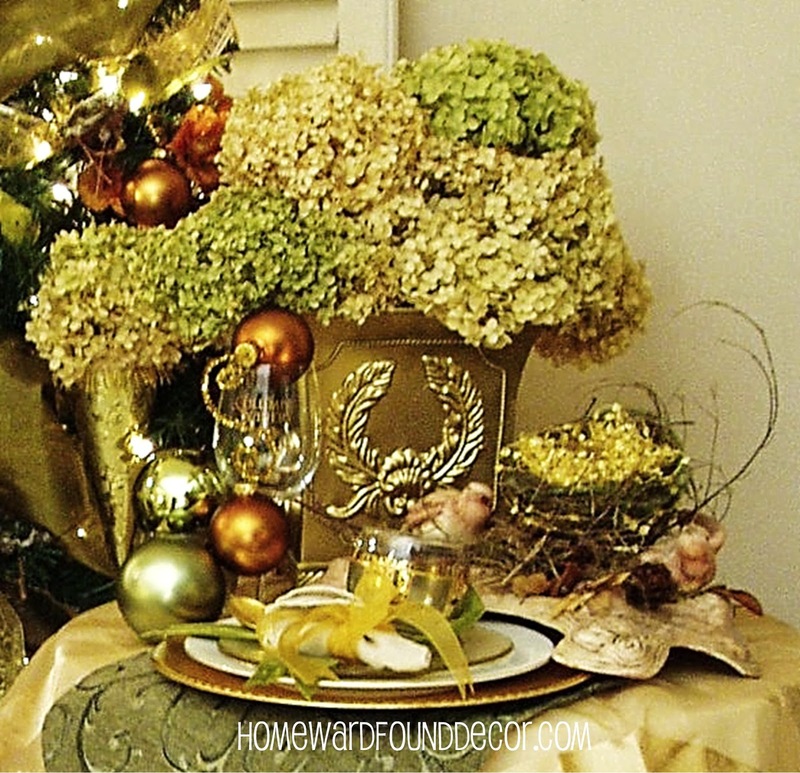 vignettes to illustrate inspiring Holiday decor ideas and themes. This 'Bird in a Gilded Cage' theme was one of them. 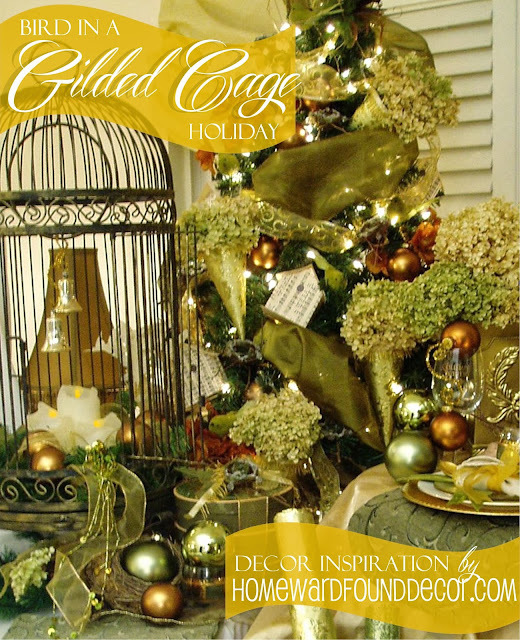 Since Gold is once again a hot decor trend, this is a perfect opportunity to share it! Found in my own yard, they had aged to soft green and tan hues. 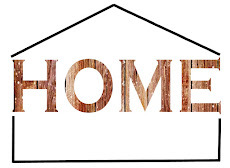 *a ceramic sculpture that looks like wood with two birds - it holds the real nest and twigs. *a gold damask stripe tablecloth and green embroidered placemats with a leaf motif. *gold charger plates, paired with a white china plate and a transparent amber glass dessert plate. *A vintage bar glass has green and gold embellishment. this one was found at the thrift store but it was black. so I painted it dark brown and then rubbed gold paint into it for an aged finish. 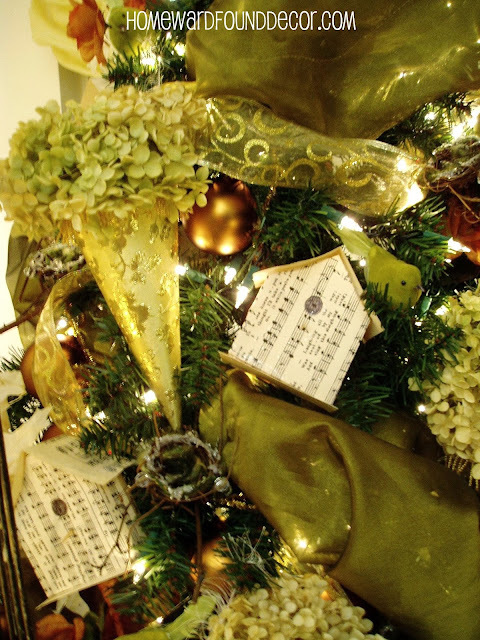 embellished with trailing gold sheer ribbon and some glass ornaments. inside the wreath are pillar candles, in a perfectly safe location! 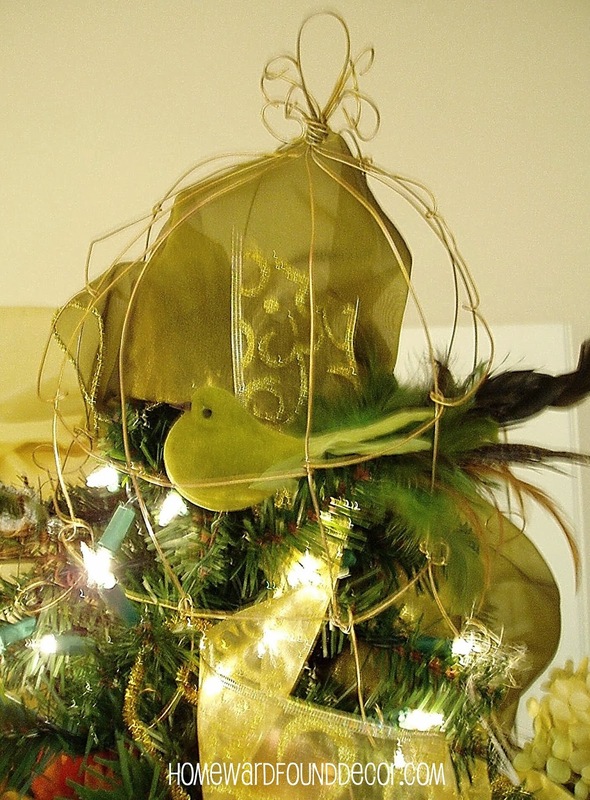 a few special vintage glass ornaments hang above, from the bird perch. *the green 'ribbon' you see here is actually swaths of sheer fabric @ 18" wide. I also used sheer gold ribbon with a swirling leaf pattern. the thing about using fabric and ribbon on trees is this: it has to look FLUID. go in and out, move at an angle down the tree as you add it for an elegant, abundant look. just makes your tree look short and stubby! that sheer gold ribbon came from the Dollar Tree store! it's really cheap stuff - no wired edges or anything. and looks like a million bucks! 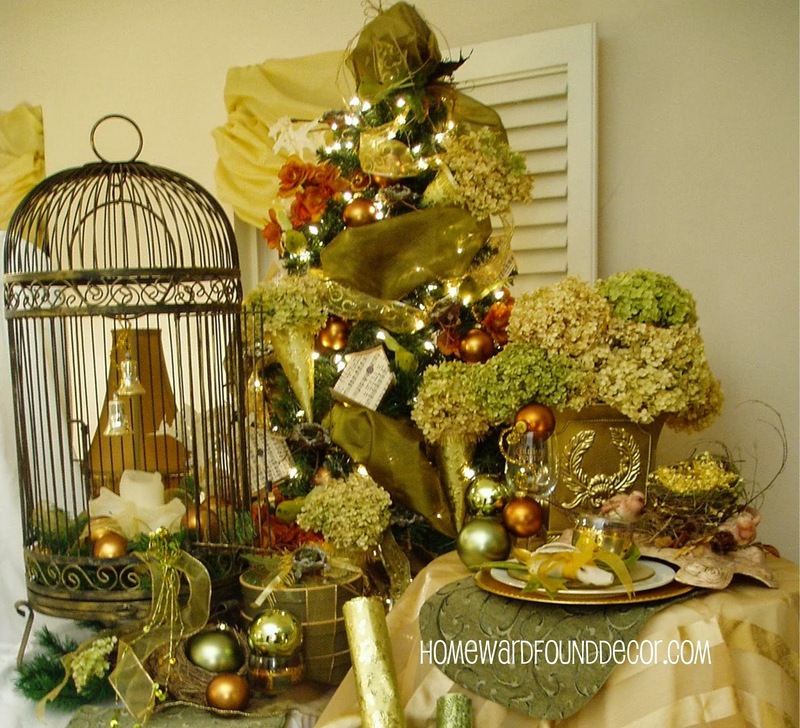 * I also tucked large hydrangea blooms into the branches, inside gold paper cones. those cones are made using the method that I shared HERE last Spring. TIP: spray your hydrangeas with a shot of hairspray, and they won't shed! the roof is one piece, the base is one piece, and the four walls are one long piece that gets folded up. hot glue holds it all together, and the 'hole' is drawn on with a marker. tiny vine nests, little green flocked velvet birds, and bunches of faux roses in copper tones. a tiny cage made from wire painted gold, sheltering a little velvet birdie. 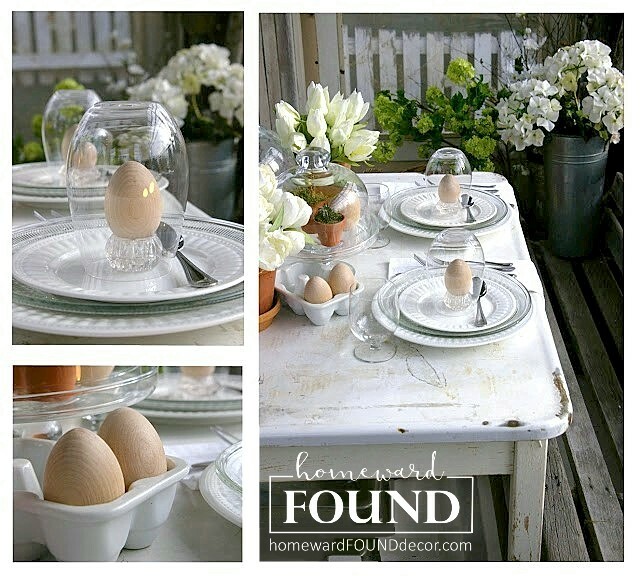 Alicia Paulson is, in my humble opinion, one of the best craft bloggers out there! she's inspiring and encouraging, and she's got SKILLZ. Well, Miss Alicia used to make these little wire birdcages . she'd attach all sorts of whimsical things to them, and she called them 'cagelets'. it will show up in another upcoming post ... maybe I'll create a tutorial for making it. an elegant yet natural decor theme for the Holidays. 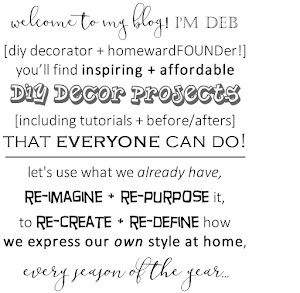 Love this, Deb! I wish I had a TENTH of your creative energy, girl!